The first trees have already been cut, the others marked with paint: 937 trees are now being cut down in the “protected” natural area of the San Rossore Regional Park between Pisa and Livorno. The slaughtered trees are the first “collateral damage” of the massive reorganization, begun these days, of the infrastructure of Camp Darby, which contains the largest U.S. arsenal in the world outside the United States. Even if the U.S. command promises to replant more trees than those cut, the construction of a railway and other infrastructure, fragmenting the natural habitats, will upset a vast ecosystem. The project involves the construction of a new railway section that will connect the station of Tombolo (on the Pisa-Livorno line) to a new loading and unloading terminal. The trains will cross the Canale dei Navicelli on a new rotating metal bridge. The loading and unloading terminal, almost 65 feet high, will consist of four 575-feet-long tracks capable of accommodating nine wagons each, for a total of 36 wagons. The terminal will be joined to the ammunition storage area by large trucks. By means of trolleys handling containers, incoming weapons will be transferred from railway wagons to trucks and those departing from trucks to railway wagons. The terminal will allow the transit of two trains per day, which will connect the base to the port through the normal lines of the Italian state railways. The reorganization of the infrastructure, which has just begun, is based on the plan to carry out the increased transit of weapons from Camp Darby. The current connection via canal and the base road with the port of Livorno and Pisa airport is no longer sufficient. The United States continuously supplies the 125 bunkers of Camp Darby. over a million artillery bullets, bombs for aircraft and missiles, plus thousands of tanks, vehicles and other military equipment in these bunkers (according to approximate estimates). Since March 2017, enormous ships have been calling at Livorno on a monthly basis. The ships unload and load weapons that are continuously transported to the ports of Aqaba in Jordan, Jeddah in Saudi Arabia and other Middle Eastern ports. U.S. forces and allies use these weapons in the wars in Syria, Iraq and Yemen. You do not need to be a skilled technician to understand what the dangers are for the population of the Tuscany region. Moving thousands of high-powered explosive warheads continuously in a densely populated area involves obvious risks. Even though the project managers describe their strategy as taking into account “human health and public safety,” an accident with catastrophic consequences cannot be excluded. Neither can anyone rule out the possibility of sabotage or a terrorist attack that could cause the explosion of an entire train loaded with bombs. This is confirmed by the fact that the plan provides for the construction of a second terminal which will be used for the operations of verification and inspection of the “suspect wagons.” Those are wagons on which a bomb could have been installed (for example, inside a container). Such a bomb, exploding on command, would cause a catastrophic chain reaction. What have the authorities done about this danger? 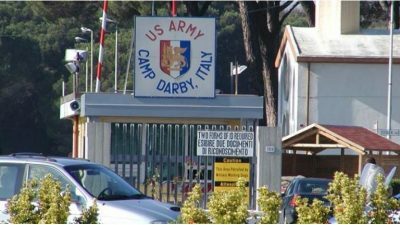 Instead of carrying out their duties to protect the citizens and the territory, the Region of Tuscany, the municipalities of Pisa and Livorno and the Park Authority have not only approved the strengthening of Camp Darby, but have contributed to carrying it out. The civil works carried out in recent years for real or alleged economic development projects (such as luxury shipbuilding) — in particular the works to improve the navigability of the Navicelli Canal and the rail links to the port of Livorno — are exactly those demanded for years by the command of Camp Darby. Its most prominent representative, Colonel Berdy [U.S. Army Garrison Italy Commander Col. Erik M. Berdy], has been received in recent months with all the honours by the President of the Tuscan Regional Council, Eugenio Giani (Democratic Party), who has committed to promoting “integration between the U.S. military base of Camp Darby and the surrounding community,” by the mayor of Livorno, Filippo Nogarin (Five Star Movement) and that of Pisa, Michele Conti (League) who have expressed substantially the same position. The trees of the Park can be cut down and the bombs of Camp Darby can circulate on Italian territory, thanks to the mutual consent of the politicians of these three major parties.